Saturday at the races attracted 64 players to Main Event Day 1A of the PPPoker World Championship at Resorts World Manila. This was the first of three starting days. No same day re-entries were allowed leaving only 22 players at the end of the scheduled 10 hours of play. Owning the chip lead was India’s Abhinav Iyer with 230,400 in chips. Iyer stacked up slowly all day then towards the latter half, he shipped all of Alex Lee’s stack with a set over two pair. From there, Iyer continued to grind to close the day in command. Another player from India also navigated to the upper ranks, Kalyan Chakravarathy. Chakravarathy was a dominating force at his table, often seen collecting chips by putting pressure on his opponents. He sealed up 206,200. Filipino player Mark Amparo was out of the media radar until he eliminated Randy Yap. This was all the ammo he needed to boost his momentum. 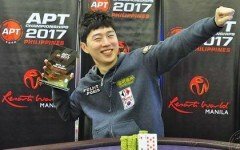 He proceeded to rail Mark Pagsuyuin on a lucky catch on the river to complete a flush. Just before the day ended, fueled in another good pot against David Erquiaga to close with 197,700 in chips. Other notable players making it through were WSOP champion Aditya Sushant, Thomas Lee, Hajime Nakagawa, and Marco Alvarez. All of these players advance to Day 2 taking place on Tuesday, February 19 at 12pm. Among the early bust outs was German pro Marvin Rettenmaier. As the day progressed, Vietnamese pro Linh Tran joined him on the rail, so did Nicandro Filart, Inaki Santos, and late entry Alex Lee. Lee had a very short day, he played less than one level falling to Iyer with set over two pair. Lim Yohwan also met his end. All of these players can jump back in on any of the remaining starting days, and they should, seeing that the guarantee is a whopping PHP 20 Million (US$382,000). The event needs 400 entries to meet this figure. Day 1B takes place on Sunday, February 17 at 2pm. Buy-in is PHP 55,000 (US$1,050).